Esophagus - Dilation in a male Wistar Han rat from a chronic study. The dilated esophagus contains feed material (arrow). 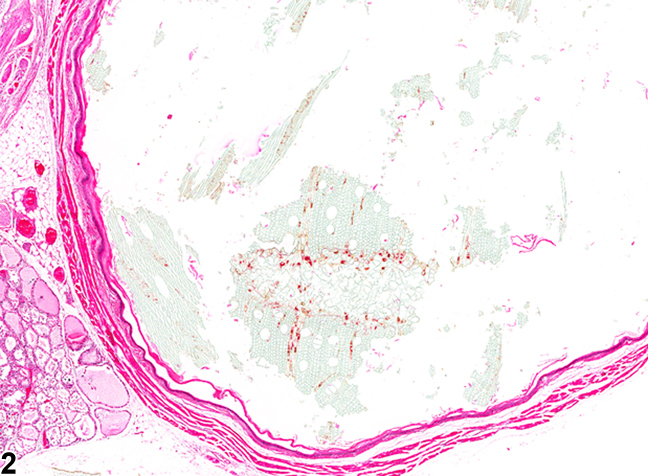 Esophagus - Dilation in a male Wistar Han rat from a chronic study (higher magnification of Figure 1). The wall of the esophagus is thin. Esophageal dilation is characterized by enlargement of the esophageal lumen and thinning of the esophageal wall. Chronic esophageal dilation may also have degeneration of the muscles and nerve cells in the wall of the esophagus. 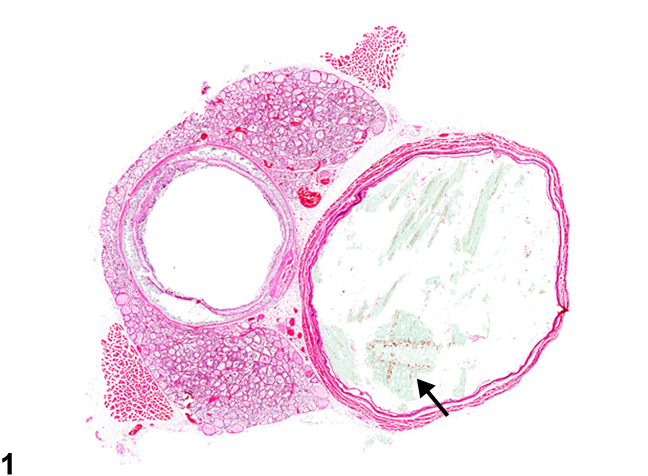 Feed material impacted in the esophagus is one cause of esophageal dilation (ectasia, megaesophagus). In NTP studies esophageal dilation has occurred primarily in female F344 rats administered a powdered diet. This lesion may result in mortality, suppurative foreign-body pneumonia, or rhinitis. Esophageal dilation should be diagnosed and graded based on the overall size of the dilated esophagus. Harkness JE, Ferguson FG. 1979. Idiopathic megaesophagus in rat. Lab Anim Sci 49:495-498.